Hey all. I got a question the other day that I thought I’d share with you all. 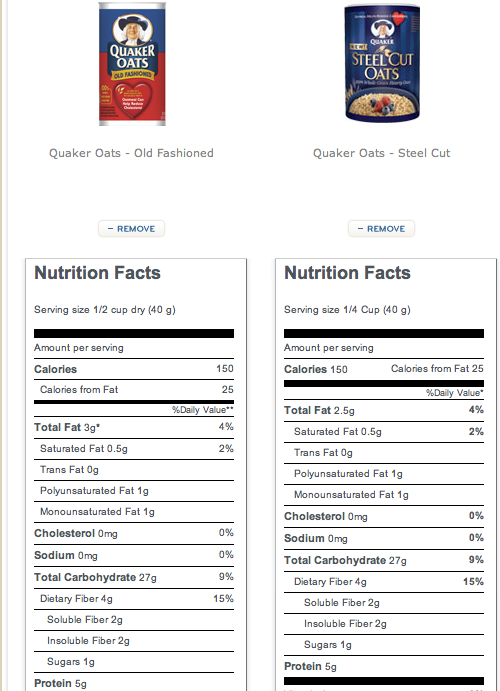 Is steel cut oatmeal healthier than rolled oats or instant oatmeal? The answer is: NO. Check out the nutritional information below. While steel cut oats taste a bit crunchier and nuttier and probably more all-natural, there is no nutritional difference. Steel cut is great if you have the time, but don’t hesitate to grab the quicker cooking variety when time is a factor. Oatmeal has great carbs that absorb slowly into your bloodstream and therefore don’t spike your sugar levels. Keep some at your desk at work and on-hand at home for a healthy snack. Add fruit, cinnamon, almond butter, chia seed, flax seed and/or protein powder for extra nutrients. Hi blogger, i must say you have hi quality content here. Your page should go viral.